You got the ticket, Ms Purrl. 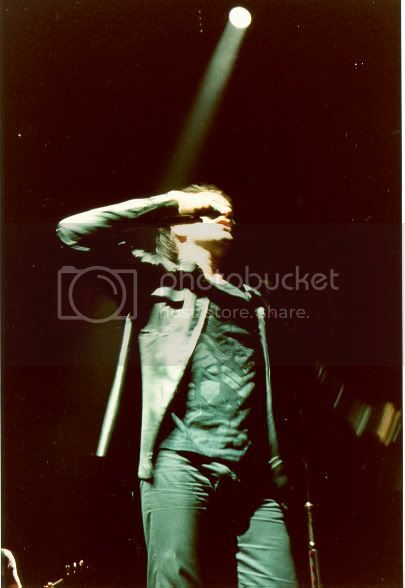 Adding a few recentish pics... Bono in summer style. He'll return to album and tour mode with a makeover, but he always wears these clothes in the summer for the last few years. It's his comfy clothes. He polished up nicely sometimes too. Random pic spam. Some random pics I haven't posted before, at least I can't remember. It's been too long since we've had a leather thread. Thank you Comet! Wow, there are some gems in here, Comet. I love the bearded ones from what, like 85 or so, and Bono getting a ticket is too funny. Plus a major win on MsPurrl's post too, of course. And this is my favorite of the recent ones. Can't wait for the tour makeover- that will be fun! Also I'm moving over this quote from the Eno thread that got bumped today. Well, he has an enormous ego, but so do most of the people I like. [laughs] And also a big ego isn't necessarily a bad thing. A big ego means that you have some confidence in your abilities, really, and that you're prepared to take the risk of trying them out. I really don't think he's arrogant. That's a different thing. In fact, he's absolutely, to me, the opposite of arrogant. He's very, very able, more able than almost anybody I know, to take criticism and do something with it. He just doesn't get upset. He doesn't take it as an attack on him if you say, oh, this doesn't work at all, it's really pathetic, actually. So it's possible to be very frank with him and know there's not some cowering insecurity inside him that is going to mean his feelings get hurt. His ego allows him to be humble, if you see what I mean. People who are very confident in themselves aren't hurt by criticism. They make use of it. I think he's very good at that. That's one thing that I really love about U2- that they are totally able to take criticism and transform it to make them better. I like that they've never placed the blame on the audience for not getting them. At the time of Pop they could have just been like, "You Americans just don't get it; we're going to flounce back to Europe and be deep and ironic all by ourselves." But they didn't. They said things like "We were out of touch, we failed to connnect." In that way I really love the huge ego, the lack of cowering insecurity. Love that too. Thanks for posting. I improved a bit on the recent Exit gif- I like this one a lot better.